Sergio Garcia of Spain leads by two strokes after a hard-fought even-par 71 on day two of the 136th Open Championship at Carnoustie. Garcia leads South Korea's KJ Choi, who fired his second 69, by two. Garcia's compatriot Miguel Angel Jimenez (71) is one shot further back, alongside Canada's Mike Weir (68). Tiger Woods struggled to a 74 to finish seven off the lead while Lee Westwood (70) and Alastair Forsyth (71) are the top Britons on one under. 2039: There are a few groups still out on the course, but none who are likely to threaten the top of the leaderboard. So I'm going to call it a night - Sam Lyon in the morning, me in the afternoon and I'm off to slap a few quid on Mike Weir...enjoy your Friday night. 2032: Pelle Edberg is blowing up down the stretch. Three under after 14, the Swede is now two over after 17 following a sequence of double bogey, bogey, double bogey. His compatriot Fredrik Andersson Hed is fairing far better over the closing holes - he's evens after pars at 16 and 17. 2028: Austria's Markus Brier stumbles over the finish line, bogeying the last for a round of 75 and one over for the tournament. The wheels come off for former USPGA champion Rich Beem at 18 - he makes double bogey to slip back to one over and seven off the lead. Frenchman Gregory Havret can't find a miracle at the last either - a bogey for him and the Scottish Open champion will be missing at the weekend. 2026: Garcia is 7/4 favourite to win the event going into the weekend, Tiger Woods 13/2, despite being seven shots back. KJ Choi is 8/1, Jim Furyk 9/1 and Ernie Els 20/1. For some reason, I just can't see Garcia holding his nerve. I fancy Mike Weir might pull this off. 2018: America's JJ Henry is in with a 71 and he's five off the lead on one under. Not many still out on the course, but there is drama on the 17th as Sweden's Pelle Edberg, still smarting from dropped shots at 15 and 16, rips off his headband and goes toe to toe with an elderly woman who scampered onto the fairway and pocketed his ball. Sorry, I made that up...I don't have any TV pictures...this is what I'm reduced to. Hello? Hello? 2009: Sweden's Pelle Edberg is in freefall down the stretch - a bogey at 16 brings him back to even par for the tournament. Scottish Open champion Gregory Havret of France needs an unlikely birdie at the last to make the cut. Big names to miss the projected cut today are Phil Mickelson, David Toms, Paul Lawrie, Colin Montgomerie, Darren Clarke, Geoff Ogilvy, John Daly, Davis Love and Nick Faldo. We wish them all a safe flight home. 2003: McGinley is managing to hold his round together - that's par at 15, 16, and 17 and four at the last would give him a 75 and even par overall. 1950: The cut, we think at this stage, will be four over, which would mean the end of the road for Colin Montgomerie and Paul Lawrie, who won at Carnoustie in 1999. I've just lost pictures for the evening which means I am now doing the commentary from a leaderboard, which brings a whole new meaning to the word 'pointless'. Edberg did emerge from the aforementioned thicket on 15 to make double bogey and slip back to one under. "Gentlemen, why does the PGA condone the filthy habit of these professionals spitting? Hankies are not expensive!" 1939: Tom Lehman, champion in 1996, is putting a good round together, he's one over for the day going down the 18th and three over for the tournament. Edberg is up to his neck in it on 15, I can just see his shock of blonde hair poking out from a thicket to the left of the fairway. 1934: France's Gregory Havret, winner of the Scottish Open, slips back to five over with a bogey at 15, but Beem is still trucking along nicely, that's a par to stay at one under. US amateur Ryan Moore shows his class with a doozy of a long iron approach at 15. He's four over and in with a chance of making the cut. Edberg has a rush of blood, yanking his approach at 15 way left. 1932: That's a pearler of a shot from McGinley, judging the contours to perfection on the 16th green and he'll have a relatively straightforward putt for par. 1926: JJ Henry plays a fine iron into the 15th green and he'll have a birdie putt to move to two under. Monty finishes with a solid par and a round of 74. The Scot is five over and now has an hour or so to wait until he finds out if he's made the cut or not. Cink comes over a bit lady-like on the 18th, leaving his birdie putt short. He finishes with a 73, but is within striking distance of the lead at even par. 1922: One of the shots of the day from Cink, a hybrid to the centre of the 18th green. Monty matches the American and he may need to rattle in that birdie putt to book his sport for the last two days. The magnificently-named Pelle Edberg moves to three under with a birdie at the par-five 14th. Great name, bad headwear from the Swede, who looks like he just stepped off the set of Fame. 1918: Verplank finishes with a 73 and at three over for the tournament - the American Ryder Cupper will be at Carnoustie at the weekend. Poulter follows him in with a par at the last for a round of 73. The Englishman is three over. 1914: Austria's Brier is back ot two under with a birdie at 14. McGinley is looking vert grim-faced but that's a fine approach to the heart of the 15th green. That's peche de la peche from Mike Weir, flopping a bunker shot to within a couple of inches for a 68 and three under overall. The Canadian is a hardy performer and could be a threat at the weekend. 1910: Monty borrows too much at the 17th, but makes par to remain at five over. Cink is down in four and stays even par. 1906: Woods is unable to sink his lengthy par putt at 18 and that's a bogey five, a round of 74 and one over for the tournament. Rose (71) also makes bogey to finish on four over and that's a double bogey for Lawrie - he finishes with a 74 for five over overall. He may or may not be there at the weekend. 1900: Tiger comes up well short with his bunker escape and that's got bogey written all over it. Weir pars the 17th and a par at the last will give him a 68 and three under overall. McGinley drops another at the par-five 14th to slip back to even par. 1857: Lawrie finds the heart of the 18th green with his fourth and Rose plonks his second on in two. Woods makes a real hash of his approach, not sure what happened there but it looks like he's found the sand to the front right of the green. 1854: America's Rich Beem misses his par putt at the 13th left of the hole and he slips back to one under. Monty makes par at 16 and he needs a three-four finish to book a weekend spot. Scott leaves his birdie putt short at 18 and he's in with a 70 and slap, bang in the mix. Davis Love finishes on eight over, although he managed a fine 71 today. 1850: My first sighting of Adam Scott and it was worth waiting for, the young Aussie, one over for the tournament, bending in his approach to the heart of the 18th green with a long iron - he'll have a putt for a rare birdie at the hole. Woods pulls out the big fella at 18 and ends up on the left-hand edge of the fairway. Lawrie has made a real hash of his tee shot and he could be on his way out - anything more than a bogey and he's on his way home. Rose finds the fairway before Lawrie reloads and slaps his third down the middle. "I'm thinking of escaping Carnoustie tonight and heading to Dundee. No disrepest to Carnoustie, but I have literally been to every pub and most of the restuarants. Does anyone have any suggestions as to where to go in Dundee? Scotland's fourth largest city, the city of Discovery, home of Ricky Ross of Deacon Blue and those indie scoundrels The View." 1844: Woods just leaves his birdie putt right of the hole at 17 and that's a four. Weir moves to three under with birdie at 16. Immelman comes in with a 74 and the South African is three over for the tournament. Faldo drags his par putt left at 18 and the great man's in with a 73. Ten over for the tournament, but he could be a force at next week's Senior Open at Muirfield. Rose makes bogey at 17. 1840: Weir unleashes a magnificent tee shot at the par-three 16th and Woods gets close with his approach at 17. Rose splashes out with his third and he'll have a brute of a putt to save par. Lawrie digs out his bunker shot and he too will have a lengthy putt for par. Here's three-time champion Faldo - he's a very creditable one over for the day but nine over for the tournament. Nice touch from the bunker and he'll have a shortish putt for par. 1836: Monty finds some sand at the 15th but splashes out to within 15 feet and he'll have that for his par. 1830: American amateur Drew Weaver finishes with a round of 72 for six over par, which means our bright new thing Rory McIlroy looks like he will get his young hands on the Silver medal. 1826: Monty ends a run of two bogeys with a birdie at 14, but he was inches away from an eagle. He has moved back to five over, which is currently one shot off making the cut. He's going to have to be steady as you like on these last four holes if he wants to be working at the weekend. Meanwhile Woods pops in his little par putt over on 16. 1825: Time for a Tiger Woods update. The world number is a bit short off the tee at 16 but chips up to give himself a little knee-trembler for his par. 1822: The challengers are dropping like flies. Stewart Cink finds trouble at the 12th and a double bogey sees him slip back and Jimenez is on his own at three under. 1816: We have just had a rare sight of three-time Open winner Nick Faldo. Old Nick is hitting a bit of form - he has sunk birdies at 14 and 15 and hits a lovely second to the 17th green. Unfortunately it is all a bit late as he's nine over par. Even a hole in one at the 499-yard 18th hole will not be enough for England's greatest, but might just set him up for next week's Senior Open. 1812: Rich Beem double bogeys the 10th hole to slip back to one under par. We have a new name on the leaderboard. Pelle Edberg, who is almost the combination of a great footballer and a tennis legend, has knocked in five birdies on the front nine to go out in 33. Let's see how he fares on the nasty back nine though. 1808: Retief Goosen misses his par putt at the last and slips back to one under. A level par 71 for the Goose, which included five birdies and five bogeys. 1759: Woods pulls out the big stick at 14 and carves his drive onto the 4th fairway. Woods is spraying it about like an unmanned hose at the moment. Clarke comes in with a 76 and he finishes six over, while Michael Campbell makes 78 and is four over - the Ulsterman will be with his kids at the weekend, Campbell will still be ploughing away at Noustie. 1757: Cink pops in a missable putt at 12 for a double bogey and he tumbles back to one under. Rose makes bogey at 13 to slip back to three over. 1753: The wheels are coming off Cink's round, he could make triple bogey at 12. Woods has changed his strides from fawn to black. Better, Tiger, better...and that's better golf, too, just coming up short with his birdie putt and tapping in for par at 14. Monty's five over after a bogey at 12, and Raphael Jacquelin of France has just come in with a 69 for one over overall. 1749: "Be good," says Rose to his ball after a decent approach at 14, as if he's just dropping off his teenage daughter at a youth club disco. McGinley makes bogey at 10 to slip back to even par. 1745: McGinley plays a spanking third at 9 after splashing out of a bunker. He'll have a 10-footer for par. Cink finds some ugly stuff just short of the green at 12 and he could struggle to make par from there. Goosen pours in a monster at 17 to get back to two under. 1742: Rose, Woods and Lawrie make par at 13 and Choi rolls in his bogey putt at 18 for a 69 and four under overall. 1739: Choi just leaves his par putt to the right of the hole at 18 and there's still a bit of chicken on the bone, he'll have a tricky one coming back for bogey. Woods leaves his birdie putt at 13 just short and stays at one over. Howell pulls his par putt at 18 and he finishes at plus four for the tournament, which should mean he's here for the weekend. 1737: David Howell gets sand pie all over his face at the 18th, but it's a fine bunker shot and he'll have a makeable putt for par and three over for the tournament. 1734: Goosen makes par at 16 to stay at one under before Cink curls his birdie putt at the 11th just past the hole. He remains at three under. McGinley is still battling and he makes par at 9 to stay at one under. 1732: Choi, gripping his iron halfway down the shaft, does manage to push his second at the 18th safely down the fairway. 1728: Rose's birdie putt just lips out - bit too much heat on that - but the Englishman is playing by far the best golf of his trio. Choi, it appears, can get a decent swing at his second at 18. Australia's Pampling, who led after round one at Carnoustie in 1999 before missing the cut, bogeys the 18th and is even par for the tournament. 1725: Perfect tee shot from Monty at 11 but Choi is in a spot of bother on 18, his tee shot very nearly finding the Barry Burn. He'll only be able to nudge it down the fairway from there. Woods raps his birdie putt at 12 to within three feet. 1720: Monty just misses with a birdie putt at 10 and he's two over for the round and four over for the tournament. Monty's sunny demeanour has diminished somewhat. He now looks like he's traipsing round B&Q on a Saturday evening. Magnificent second shot from Rose at 12, but Lawrie gets inside it, slapping a hybrid 248 yards to within two feet of the pin. Woods is safely on as well. 1714: Mike Weir of Canada birdies 10 to move to one under. Rose and Woods find the fairway at 12. Goosen, two under, finds himself plugged in a greenside bunker at 15 but manages to gouge the ball out. Rich Beem, the 2002 USPGA champion, moves to three under with a birdie at 6. 1711: Lawrie drags his par putt left at the 11th and he'll drop back to four over. Woods and Rose do make par. Choi's approach at the 17th rolls off the back of the green, but he should have no problem getting up and down from there. There are currently 18 players under par. 1708: Cink, three under, misses the fairway at 10 but Monty booms one straight down the middle. Colin faces a struggle to make the cut - another dropped shot on the back nine and he could well be toast. 1704: Monty is imploding and he drags his par putt at 9 left of the hole to slip back to four over. Woods comes up short with his second at the par-four 11th and Rose sends his rolling past. Woods may be wrestling with his game today but he doesn't look unduly concerned as he natters away with Rose on his way to the green. 1658: Choi very nearly ties the lead at 16 but his putt just misses to the right of the hole. Choi is coming off the back of two big wins at the Nicklaus Memorial and Woods' AT&T National. He should be in the mix until late on Sunday. 1651: Monty does make par at 8 before Choi gives himself the chance of a birdie with a sweet tee shot at 16. Woods finds himself in the middle of three trees but he's got a shot and chips on to within a foot. Lawrie and Rose get their first putts to within a couple feet and that's pars all round. 1647: Woods is not in the horrible stuff at all - despite missing the fairway, he's managed to find a flat spot. Monty displays the touch of an axe murderer in missing with a birdie putt at 8. Woods looks like Woods but he's playing like Mike Reid at the moment - another almighty lash and his ball just misses a burn in front of the 10th green. 1643: Woods just said a rude word! Another slash at the ball on the 10th tee and the balls ends up in some horrible stuff to the right of the fairway. Choi drains a long putt at 15 and he's now one off the lead. The Korean is a very solid little trouper. 1638: McGinley is getting to grips with his round after some early travails, sinking a birdie putt at 6. Having said that, he's pushed his tee shot at the next into a pot bunker. Woods makes par at 9. Woods has the happy nack of appearing to have a shocker of a round and ending up with a 72 or 73. I think that could happen again today. "Why can't Monty be gracious and acknowledge the applause of the crowd for a bogey as Woods does?" 1634: Cink doesn't hit his birdie putt at 7 - that would have given him a share of second. Magnificent bunker escape from Woods at 9 and he's got a short putt for par. "Tiger Woods says the best part of being at home is knowing all the channels on his remote control. Apparently he is having no troubles remembering what's on offer in Carnoustie, 'No cable', he moaned. 'We have five channels. They had one show about vegetables. They were giving out ribbons for brussels sprouts'. Welcome to Great Britain Tiger. Never fear, we've got Sky in our house so you are more than welcome to come round and have unlimited use of the control until Midsomer Murders comes on." 1627: Goosen drains a beauty at 12 to remain at three under. Choi of Korea bends one in at 14 to move to four under and outright second. News of Darren Clarke - he's even par for the day and one over for the tournament. Cracking long iron into the 9th green, but Woods blocks his approach right - his swing doctor Hank Haney won't be getting his head down until the wee small hours this evening. 1621: Rose pours in a lengthy putt for birdie at 8 but Tiger's par putt lips out and the defending champion tumbles back to one over and seven off the lead. Poulter's little purple patch comes shuddering to an end as he bogeys 7 to slip back to two over. 1617: Poults throws the kitchen sink at his bunker shot at 7 and plops the ball onto the fairway. Woods splashes out at 8, but the ball trickles 10 feet past the cup. Really out of sorts Tiger, it could be a case of damage limitation today for the world number one. Two bogeys in a row from Monty at 5 and 6 and he's now three over. Cink misses his birdie putt to go four under - chance missed by the American, who took three hits from the front of the green. 1612: Lovely touch from McGinley at 4 and he's got a 15-footer for birdie. Poulter throws a few of his toys out of the pram after stiffing his tee shot at 7 into a bunker. Woods has yanked his tee shot at the par-three 8th into a greenside bunker - he's all over the shop off the tee today and got the raving hump about it. 1606: McGinley is enduring a torrid start to his second round and he misses the fairway on the 4th. Lawrie, Woods and Rose make par at 7, Choi leaves his birdie putt short at 13 to remain three under. Poulter of England birdies 6 and is one over. 1601: The cut, I'm told, is expected to be three or four over at the end of the day. Both Woods and Lawrie overcook their approaches at 7 while Rose gets his wedge caught up in his skirt and comes up short. McGinley putts through a sprinkler at the 3rd - he was able to move the ball there according to Open rules. Doubley bogey and he tumbles back to one under. Silly mistake. 1558: Let's see if Tiger can hit one straight at 7. He does so, pulling out an iron and punching the ball straight down the middle. Looks like a peach of an afternoon up on the Angus coast, plenty of blue with the odd fluffy white cloud. Goosen rattles in a long putt at 10 to move to three under. Dangerous competitor is the South African. 1550: Nervy start from McGinley who finds a fairway bunker at the 3rd. Woods makes par at the very birdieable 6th and it's all a bit of a struggle at the moment. Rose does make birdie to move to three over. So, Boo Weekley once had a punch-up with an ape. Anyone who has ever tangled with an Essex bouncer will be able to make the same boast. "More about Boo. He chews tobacco, much like Sheriff Buford T Justice in Smokey and the Bandit. He claims to hate golf, has fought an orangutan and is mates with Bubba Watson." 1545: Woods is having a shocker off the tees and he's very nearly gone out of bounds on the par-five 6th. Rose finds the dancefloor with his second, but Woods isn't able to find the green with an almighty hack from the rough. Even so, that was brutish strength from the world number one. McGinley makes a solid par at the 2nd. "My boss also looks like Barry Chuckle. I am going to start humming the theme tune, I will let you know if I get sacked in the next 10 minutes." 1540: Woods makes par at 4, as does Rose, but Lawrie makes bogey. Majestic middle iron from Poulter at five and he's got a shot one for birdie. Monty drains another tricky par putt at 4. "Former USPGA winner and BBC commentator Wayne Grady invited mole and pals round to his beachfront house for a good old-fashioned Aussie barbie the other night. The food was superb and 'Grades' was a magnificent host. He wielded a set of tongs with the same panache as he did with a pitching wedge in his prime. I practiced a few indoor swings with his clubs but quickly put them back before breaking something. After all, he needs them for his debut at next week's Senior's Open at Muirfield." 1537: The Americans have sent a few characters over this year, and here's Charley Hoffman making bogey at 17 to slip back to even par. There are lots of people who look like Charley if you have a flick around the '900s' on Sky (you'll need a credit card...). 1530: Monty looks in fine fettle today and he just misses his lengthy birdie putt at the 3rd. Forsyth of Scotland will be around at the weekend - he finishes with a round of 71 and is one under overall. McGinley, who led for a long time on Thursday, bogeys the 1st to slip back to three under. Darren Clarke bogeys the 9th and is one over. 1525: Two-time US Open champion Retief Goosen is going along pretty nicely and he makes a nice up-and-down from a bunker at nine for par. He remains four off the lead. Stricker dropped two shots at 10, but manages to get one of them back at 11. Woods chunks his second at the fifth - he could be struggling to make par. 1521: Woods is struggling with his game a little and he gives out a little cry of "no" after his tee shot at five. It's OK though, just in the wispy stuff to the right of the fairway. Monty finds the third green comfortably with his approach. 1517: Off goes Ireland's McGinley, punching an iron down the middle of the fairway at the first. Woods may have a nice sweater on, but I'm not sure about it being paired with 'fawn' slacks, he looks like he should be in Tenko. Poulter misses his par putt at the third to slip back to three over. Rose makes par at the fourth, as does Woods. If anyone needs cheering up, have a look at the link below. Genius. 1512: Monty rolls in a dicey par putt at 3 before storming off the green, caddie in his wake, like someone who's been stuck on a broken down train without a toilet for nine hours. 1506: The observant among you will have noticed I have included a little 'sunshine' graphic (for internet users only, one of my editors has just told me), which means there is sunshine at Carnoustie. Apparently I included the wrong pic below - it has now been rectified. Sorry. 1500: Rose's birdie putt at the third lips out. Lawrie too makes par, as does defencing champion Woods. Goosen, on six, rolls an eagle putt to within a few feet before missing for birdie. Ouch. I have included a pic of intrepid South African Willie Smith, who lowered himself into the Barry Burn at the first and retrieved Woods' ball. 1457: Woods plays another dreamy short iron into the third green, although the contours take it further away from the cup than he might have expected. Stewart Cink, I'm told, also birdied the first along with Monty. The American is three under. 1451: Swindon's David Howell drains a birdie putt at 8 to move to even par, but KJ Choi yanks a tiddler left of the cup to drop back to two under. Raucous cheers on the first as Monty makes birdie - the home favourite moves to one over. "My sister has just rechristened Miguel-Angel Jimenez 'The Ginger Dustman'. I think it's a bit unnecessary." 1449: Monty plays a peach of an iron into the 1st green and it would be nice to get the big man on a roll today. Lawrie bends in a lengthy putt at two for birdie and Woods follows suit to get back to one under. Nice sweater Tiger's got on, I believe that's 'camel'. 1446: Darren Clarke, too, has plumped for tartan - he looks like a rotund, female American tourist strolling the streets of Edinburgh. His blade is hot though and he rolls in a birdie at 6 to add to another at 5. 1443: Woods looks fired up after his first-hole travails - crackerjack approach at 2 to within six feet of the pin. Rose sets up another birdie chance with a solid short iron. Poults rolls in his par putt at 1. 1437: Woods pulls out his three wood on the second tee and this time finds the fairway. Here's Poulter at the first, and that's a classy approach - he'll have a 20-footer fo birdie. Tartan strides again for Poults...but what's this?! A bit of blue in the gallery! Some old fella's being goosed up by his old woman! What has the Open Championship come to? It's like the last days of Sodom and Gomorrah along the fairways of Carnoustie. Classic Alliss - "I wish we could see the other side, we might get a shock..."
1435: Rose bends in a 15-footer at the first to move to three over while Lawrie makes par. Weekley's blowing up down the stretch - bogey at 16. "The irony is that we all know that even with his belly putter, Garcia has not got the stomach to win this tournament." 1431: Stricker rolls one in at seven to move to three under - birdies at the last three holes for the American. Tiger two putts at the first and he's only the third person to make six on the opening hole so far. "Many of you have texted in to ask if I went back for another sliver of deep-fried pizza last night. Don't be silly, there's no need, I can still taste it 36 hours on. Instead I took in the delights of the much-hyped Scotch Corner Café on The Strip (Carnoustie - twinned with Vegas). They started opening 24 hours a day last night for the duration of the Open. Considering the only thing I have seen after midnight in Carnoustie is a bat and one of my housemates in his underpants, it seems a slightly ambitious plan. FYI: I had a jacket potato. Rock and roll." 1421: Here's Tiger on tee - he pulls out his iron, gives it some hammer...and hooks the ball into the Barry Burn and out of bounds. Reload big man. He takes an iron out again and pushes his third shot into the wispy rough on the right-hand side of the fairway. Paul Lawrie blocks his drive right into a bunker, but England's Justin Rose finds the fairway. Garcia makes another clutch putt and that's a solid round of 71 and he regains the clubhouse lead on six under. 1420: Gossamer touch from the edge of the 18th green from Garcia and he should ram home the par putt. Up goes a cheer - someone's done some thing a little bit special...it's not Weekley though, he's dropped a shot at 15 to drop back to three under. 1415: Weekley's recovery is not the best andthe ball rolls fully 40 feet past the cup. South Africa's Retief Goosen misses a 10-yarder for par at the fourth to drop back to one under. 1411: Boo Weekley plays an errant approach to the 15th green. On first look, it appears the American's forearms are covered in tats and that he should be walking down the fairway with a pitbull and chugging on a can of Special Brew. However, it's actually a horrific undergarment he's wearing. Walter Hagen will be turning in his grave. 1407: Afternoon all, and as I was plumping up my cushions Garcia made a ballsy putt on 17 for par to remain six under. He must have mixed feelings about this new belly putter - on the one hand it's working like a dream, on the other hand he must be cursing himself that he didn't buy one before now. In fact, he must feel like balding people feel when they finally decide to shave all their hair off. 1401: A quick word on the greatest struggler of the day - England's Steve Parry, starting the day at just two over, is now 11 over despite a birdie at the first. A run of double-bogey, five bogeys and another double bogey have him swishing about like an 11-year-old with a plastic lightsaber. Withouth the cool light bit in the club face. Bless 'im. "Ian Poulter has alot to answer for; he may be trying to brighten up golf but it has resulted in every junior at our club dressing like a 1970s pimp. Somebody stop him. White belts should be banned." 1351: Many people's tip Phil Mickelson will not feature this weekend after taking a double bogey at the last to leave him six over par. Westwood, on the other hand, is right in contention after a bogey at the last gives him a round of 70 and leaves him one under. Over on the second, Retief Goosen goes to two under with a birdie. It has also come to my attention, via your texts, that a lot of you know an inordinate amount about Percy Shaw, cat's eyes and pencil sharpeners. How very strange. "Given that the Open started with Seve announcing his retirement, it would be fitting if Sergio were to lead from gun to tape." 1347: Sergio Garcia's excellent tee shot on the 16th reaps some reward with a par on what is proving one of the most difficult holes on the course. It keeps him in the lead by two. Lee Westwood, meanwhile, will drop at least one at the last after poor second and third shots, leaving him with a tricky eight-footer for bogey. 1342: Alastair Forsyth is struggling to maintain his early form, with bogeys at the eighth and 10th seeing him slip back to level par overall, in a tie for 21st. 1337: Good save from Sergio Garcia, who sent a long birdie putt eight foot past the flag at the 15th, but then holed out for par. Three pars to finish and the Spaniard will be firmly in control with low scoring increasingly hard out there. 1328: Poor finish from Vijay Singh who, having bogeyed 15, drops two more shots at the last with a terrible second shot that went out of bounds. His round of 71 leaves him one over and that might prove costly. Meanwhile, my colleague tries to note down Miguel Angel Jiminez's reaction to his round of 70, which leaves him three under, but can only decipher the words "eth-eth" and "scorchio". Or something like that. "What a shame that is for Vijay. A terrific round and it's all undone with a poor shot at the last. That will keep him awake tonight, I'm sure and it won't make his charge at the weekend any easier." "How very dare u speak of the gorgeous (she didn't put it quite as subtly as that - Ed) Ian Poulter in such a manner!" 1322: Birdie for Garcia at the 14th - bootiful stuff that from the gifted Spaniard - and his lead is back to two. 1319: "Wake up" Boo Weekley storms into joint second with a birdie at the 10th and then misses a birdie chance at 11 for a tie for the lead by a matter of a few inches. The American is playing some fine, solid golf at the moment. "Hello sunshine! It's the first appearance of the week from the sun, but almost certainly the last appearance of the week from Jon Daly. I nearly trod on his ball 60 yards from the 17th green - I didn't expect even Daly to hit a 400-yard drive across the burn. Amazing scenes!" 1312: Rory McIlroy looks like he's just found out he's passed all his GCSE's as he sees out his round of 76 with a par at the last, and the Northern Irish amateur will definitely be back for the weekend. 1309: Over on the first tee, having been announced by the inimitable squeak of Ivor Robson, Michael Campbell gets match 35 under way with a nice drive down the middle. Northern Ireland's Darren Clarke follows suit and it's all very jovial out there. "Percy Shaw invented the cat's eyes and he is from Halifax." 1304: Jim Furyk can only bogey the last to finish on two under overall, with playing partner Niclas Fasth seeing out a brilliant 69 with six pars on the trot and he lies two over. Nick Dougherty will also be in the next round after completing a round of 74, leaving him three over. "Players have found it hard work today, and that has been reflected in the scores. It means something like a round of 70 will not be a bad score at all. It's all been a bit of a struggle." 1301: News just in for all those who are desperate to know what kind of clothing monstrosity Ian Poulter will be sporting today - it looks like a mix of deep purple and navy. He has also complained of having a migraine, which is no surprise given that horrific clash of colours surely. 1255: Excellent birdie effort from Garcia at 12 as a 40-foot putt drops inches short of the hole, the Spaniard cleaning up for another par. 1254: "Luke Donald was just describing how the noise of a club jangling put him off as he ran up a triple-bogey eight at the 6th on his way to a 76 for four over. The club in question belonged to amateur partner Llewellyn Matthews of Wales, and the sound was the club settling in the bag. Donald wasn't in anyway attaching blame, merely pointing out some of the circumstances surrounding his blip. "When asked if he'd ever done that sort of thing himself, Donald said: 'I got told off by Vijay Singh a couple of years ago for making a noise with the Velcro on my glove. He's got very sensitive ears. I think I apologised and then did it again a couple of holes later.'" 1246: Lee Westwood storms back into the mix with a quite brilliant eagle three at the 14th, leaving himself little more than a six-footer to hole after two fabulous woods. "Re: McIlroy's girlfriend (see 1151). All I know is that her name is Holly. Other McIlroy trivia: He is from Holywood in Northern Ireland (population 12,000). When asked if anyone else famous is from there yesterday, he revealed that the guy who invented cat's eyes hails from the town. NB: I have no idea if that is true and as trivia goes it is thoroughly lame. Apologies." 1239: Sergio Garcia errs on the relatively easy 11th and can only bogey courtesy of a long putt, meaning his lead is cut back down to one. Rory McIlroy, meanwhile, trousers packed so tightly round his backside it's a wonder, erm, he can breathe, has now gone through the last four holes at one-under - including a par at the tricky 16th - and his tee at the 17th flies down the fairway. 1231: Great comedy from Miguel Angel Jimenez - and I'm not just talking about his ridiculous Mick Hucknall-esque hair - as he sends his tee shot on the par three 16th within a foot of the hole and then proceeds to act up like a spoilt child much to the gallery's delight. It was all in jest from the Spaniard, which is more than can be said for the barnet - is it for a bet do we think? He goes on to hole easily and that's the first birdie on 16 of the day. "I have to happy with my total. I was striking the ball well but I left a lot of shots out there, especially with my putter." Ernie Els, who struck a round of 70 to leave himself level par for the tournament. 1226: First mention of the day for the top Scot on the leaderboard, with Alastair Forsyth birdieing six to go back to two under and a tie for seventh. A bogey on the par-four third aside, Forsyth has been in terrific form so far this afternoon so things are looking rosy for the home support. 1223: Vijay Singh moves back to two under with a birdie at 14 after a wonderful pitch from the rough around the green, while Sergio Garcia narrowly misses a birdie attempt at 10 with an excellent putt from distance. The Spaniard has gone close a few times today and you wonder if he might regret not taking more chances when he gets on the more difficult last few holes. 1219: Top stuff from Johann Edfors, who having found the water hazard at 10 proceeds to drop it back in twice - forcing his caddy to go for a little paddle to fish it out. The Swede is clearly finding it hilarious, the caddy less so. Luke Donald, meanwhile, completes a difficult round of 76 and, at four over par, he will be waiting nervously to see if he has made the cut. "Colin Montgomerie appears to have slept off yesterday's grump. He's dispensing jokes and bonhomie on the putting green, with Justin Rose the main, but not sole, recipient. Nick Faldo's also there, arriving one hour 53 minutes before his tee time." 1211: Your favourite and mine Boo Weekley birdies the sixth to pull him back to three under and to within three of Garcia's lead, and then narrowly misses another birdie opportunity at the seventh that would have drawn him alongside Paul McGinley in second. 1205: Welshman Bradley Dredge sees out his second round with two bogeys on the last three holes and he will not make the cut, standing as he does at eight over. A nice weekend off with his head in the new Harry Potter book for him, then. "Apologies to all the TV viewers that have lost pictures from the golf - the Carnoustie style severe storms that have hit London took our satellites out. Apologies. Ironically there's bright sunshine up here now and would you believe it there is a queue at the ice cream van. This country." 1201: Hiccups for Padraig Harrington and Vijay Singh, the pair bogeying the 15th and 13th respectively to leave them both two under and four off the lead. The back nine at Carnoustie really is proving a nightmare, with all but the odd birdie available solely on the front holes. A word on another big mover for the day, though, as veteran Mark O'Meara birdies the sixth to go three under for the day, level par for the tournament. "Am I on the correct website - I'm reading about an Irishman getting up and down brilliantly for his second birdie of the day - Where do these modern sportsmen get there energy?" 1147: Missed opportunity for Garcia at the eighth as his birdie attempt putt goes wide and he has to settle for a par. And, for those of you that are interested, while it's sunny and lovely in Carnoustie, near apocalyptic rains have arrived in west London. So while it's July in Scotland, it's clearly late November here. Rubbish. "I don't want to reinforce the stereotype of women watching sport, but Sergio Garcia makes me come over all giggly." 1141: Well deserved cheer for Padraig Harrington at the 14th, the Irishman getting up and down brilliantly for his second birdie of the day, and he moves back to within three of Garcia. By the way, I don't want to send anyone into convulsions or anything, but I do believe I detect a bit of sunshine at Carnoustie. Hold on...yep, there are shadows on the fairway! Woohoo - it's July people! 1136: News coming through that Henrik Stenson faces a £1,000 fine for his toys-out-of-the-pram moment earlier. Geeze, that's gonna hurt the millionaire Swede isn't it. He's probably got it on him. 1130: Rory McIlroy has a bit of a hissy fit as his approach at the 12th goes long on the green - the sort of shot I would be talking about for hours in the pub afterwards had I hit it - and throws his club up in the air. Unfortunately for the youngster, his wrist action wasn't quite in place for the toss and it comes back and bonks him on the bonce. Silly boy. "Please, please don't post any more pictures of the normally faceless online and backroom BBC pundits. They spoil the illusion of beauty." 1127: Jim Furyk pushes a short putt wide of the hole at the 12th to drop a shot and move to three-under, making Paul McGinley outright second once more. "As a fellow Sky Blues fan i whole heartedly agree with Paul. Still, at least we haven't spent £6M on a 6ft lump with 2 left feet. The Brummies will be choking on their kipper ties. Happy days." 1124: Sergio Garcia's lead is back to two after he snatches a birdie at the sixth with a fabulous putt and the Spaniard looks so relaxed at the moment, all he's missing is a Long Island Ice Tea, pair of flip flops and a sun lounger. "Boo Weekley is a ghost-hunter magazine." "Boo Weekley sounds like a magazine for jeering enthusiasts. Along with its sister publications Cheer Monthly and the Applause Times." 1117: A quick thanks to Mark Orlovac who has filled in for the last 20 minutes or so while I grabbed a sandwich and did the tea run. I know - a man of my standing having to fetch tea for others I hear you say, it's not right is it? Although it did allow me to hear a wonderful story about Mrs Krankie from a friend which I would love to share with you. Alas, I fear the Corporation would not survive. Anyway, Lee Westwood gets rolling on my return, birdieing the eighth, to add to his birdie on the six, to move to one under. 1108: Furyk sinks the putt at the 11th and moves back alongside McGinley. All this movement is getting silly. Jimenez follows up his slip at the 9th with another at the 10th, sloppy stuff from our favourite cigar smoker (apart from Darren Clarke obviously). 1100: Furyk loses direction at the par-four 10th and slips back down to three under. He makes up for it though with a wonderful approach to the 11th green. Miguel Angel Jimenez drops a shot at the 9th is back on two under while Garcia sinks a tricky putt for par at the 5th. "Just been chatting to Gary Lineker about all things golf. He's a very good player but he told me, 'my golf is very much like my football was, useless from long range, but not bad when I get close'. He tells you more about golf and what's going on at Carnoustie in our weekly BBC Sport e-mail newsletter. Why don't all you lovely people sign up and get involved. It's an award-winning read, it's only one email a week in your inbox and it's certainly better than receiving all those ones about Viagra. Do it." 1053: McIlroy pays the price for his poor iron play on nine and sinks a double bogey to fall back to par. Over on two - the brilliantly-named Boo Weekley (as Paul in Coventry says, it sounds like what Sky Blue fans do every seven days) - bogeys to slip to two under. 1049: And it's three birdies in a row for Vijay Singh, who moves into joint seventh and two-under with a three at the seventh. McIlroy's escape from the rough is OK without being spectacular and he has hit work cut out. Meanwhile, over on 10, Furyk chips onto the green from behind a tree but his ball is still a good 15-20 feet from the hole and he will do well to save par. 1046: More bad news for Northern Irishman Rory McIlroy as he finds the hazard on ninth - he'll do well to make bogey now, says BBC Sport pundit Sam Torrance. In non-golf-related news, Tottenham have somehow robbed Birmingham of £6m in exchange for Egyptian striker Mido - the world has gone mad, surely! 1042: Sergio Garcia's lead is reduced to one as he bogeys the fourth following a wayward approach to the green. 1040: And it would appear Stenson's vicious attack on a helpless tee marker had little positive impact - the Swede going on to make a triple bogey six at the eighth and slipping to four over. Clinical psychologist Jamil Qureshi (0727 entry) would have his work cut out sorting that mess. "The crashed buggy belongs to Chevy Chase!" 1039: Paul Broadhurst is the first man home, shooting a par round with four birdies and four bogeys, and he looks pretty pleased with that - even par should be more than enough to make the cut. Nick Dougherty, meanwhile, continues his recovery after his first-hole double bogey with his second birdie of the round at the ninth. 1033: As my esteemed colleague just pointed out - it's all kicking off around Carnoustie today. First of all Henrik Stenson does his best to shank a tee marker out of the ground in a fit of fury after a wayward drive at the eighth, and then there's footage of a buggy crashed into a ditch on one of the holes. Who, why and where it was I don't know - perhaps one of you kind people could let me know? 1029: Apologies and thanks to those of you who pointed out I called Jim Furyk David Duval at 1017. I'm sure Duval is making a move of some sorts - maybe around his luxury apartment swimming pool or something - but not at Carnoustie. Jim Furyk on the other hand, is bang in contention after another impressive par at the eighth. 1025: Vijay Singh's work on the practice greens earlier (see 0704 entry) appears to be paying dividends as the Fijian birdies five and six to go one under. Andres Romero, meanwhile, moves back into contention courtesy of a superb eagle at the 14th. "The Krankies live in Torquay, but they don't like you shouting 'oi, krankies' out of a car window at them." 1022: An update on the 606 situation - apparently there was a power outage at Siemens in Maidenhead due to extreme weather conditions. As a result all services are currently down and it may take some time to be corrected as people are struggling to get in to the office at Maidenhead due to the weather. Fear not, though, you can still text 81111 and you also enjoy the lottery of whether or not anyone will ever see your drivel - wonderful stuff! "Rory McIlroy's chubby cheeks make him look like children 's TV screen spitting character Pob." 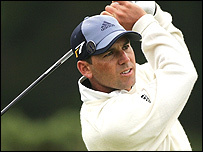 "Is it just me, or does Sergio Garcia sound like a rather exotic ice cream variety? Let's hope he keeps his cool today!" 1017: Jim Furyk is making his move people - the American birdieing six and seven to move alongside Paul McGinley in second at four under. By the way Anon via text - you are taking an absolute pasting in my inbox, most of which is not publishable, but all of which decries your comments as sacrilege and, at best, ill-informed. Not that you'll be reading this of course, what with this all being so dull hey...haha. "Bashing a ball around a field with a stick eh? At least its not cricket!" 1009: Rory McIlroy goes past with his birdie attempt and it's a three-putt for par, shame. Strange address of the ball the Northern Irishman has, which lasts all of two seconds before he goes at it like a dog on heat. Might need tweaking later in his career you feel. 1005: Rory McIlroy gives himself an eagle chance at the sixth with a fine approach, but his putt is a little too short. He'll have a six-footer for birdie. Ernie Els, meanwhile, has had a few chances go begging today, but he makes no mistake on the 10th to make birdie and go one under. Over on the second, by the way, Phil Mickelson got away with a bogey after a penalty was issued for his drop. 0958: Padraig Harrington breaks the shackles of 'the par' with a fabulous long putt on the seventh for his first birdie of the day and that takes him to three under, three off the lead. 0953: Sergio Garcia saves par on the first following his fandabidosi third shot and he retains his two-shot lead. Whatever happened to the Krankies by the way? I'll never forget the day I was told the little one was a girl. Talk about how to confuse a young, naive lad like myself. Meanwhile, there's all a bit of a kerfuffle for Phil Mickelson on the second as he and the referee have a mother's meeting about a drop and a penalty. I'll let you know how it goes when they put the pipe and slippers away. "What amazes me is not that grown men are bashing a ball around a field with a stick, it's the fact that you're sitting there telling us about it. You're a sad lot." 0946: Rory McIlroy's topsy-turvy start to his round continues as he two-putts on his way to bogey at the fifth, but Ireland's Padraig Harrington makes his second straight putt from range to save par at the sixth. "Conditions are so much calmer out here today, but it still feels like going for a stroll on a crisp winter morning. There could be some serious scoring this morning." 0940: According to Ken Brown, Sergio Garcia's second shot rocketed off a woman's thigh in the crowd and into the rough. Or, as Ken put it, "Garcia's ball bounced off a young lady's thigh". Quite. Anyway, the Spaniard pulls out the shot of the tournament so far with his recovery, wedging out of the grass and to within a couple of feet of the pin. Jubbly. 0932: Sergio Garcia gets his second round under way with a decent tee shot off the first, firing a little left but finding a decent lie nonetheless. Absolute disaster for Luke Donald over on the eighth, though, the Englishman taking a triple-bogey eight at the par five and his round is falling away like a Rich Tea biscuit in a freshly-made hot cup of tea. 0930: Rory McIlroy makes the most of his opportunity, putting home from six feet for birdie following his wonderful approach on his second shot. "There is absolutely no fear in this young man and he has played like a veteran at times these past couple of days." 0928: "Carnoustie awoke (very gingerly) to a thick but insulating blanket of grey cloud on Friday morning...and hit the snooze button. "Not for too long, though, as "Our" Ernesto Els, John "Oh dear" Daly, Loooooke Donald, Angel "of the Gorse" Cabrera, Sergio (always best said with a "Hoylake" accent) and Rory "the Mullet" McIlroy are already out there. "Out after the rain yesterday, and out now while the conditions for scoring could not be better, these chaps have had a right touch. The conditions for growing grapes and tanning, however, could not be worse. But then we haven't got a severe weather warning here so I suppose we mustn't grumble. "Rob and I are off for a cup of tea by the putting green now. We are having our own private competition to see who can get more nods of recognition from golfers on their way to the 1st tee. It's a low scoring draw at the moment." 0925: Excellent recovery from Padraig Harrington, who digs out of the rough and then holes a tricky seven-footer to save par on the second. Over on the fourth, McIlroy produces a bit of mastery of his own as he plays out of the rough to within a few feet of the hole. Birdie chance. 0921: Ernie Els misses a putt from eight feet on the seventh to miss out on birdie, but the South African's approach play has been impressive so far this morning. Rory McIlroy, meanwhile, snaps his tee shot off the fourth a little right and he ends up in the rough. 0917: By the way, if you're trying to access 606 at the moment - which I would hope millions of you are - you may find you're unable to. The assessment in the office appears to be that it is, erm, 'bogeyed' (not the exact phrase used, but you get the idea) - but rest assured our technical wizards are weaving their magic and I'm sure it'll be up and running again soon. 0914: Not the best of starts for US Open winner Angel Cabrera, the Argentine compounding a bogey at the third with another on five and he is now just one under after his fine first-round 68. 0909: Oops! Rory McIlroy drops a shot on the second to slip back to two under, but it should just be a minor blip for the Northern Irishman, who gives himself a birdie chance on the third only to lip his putt in and out of the hole from 12 feet. Come on, son, keep your wits about you and you'll be fine. "It has to be said - there is not enough Hazel Irvine on TV or the web! The babe of the BBC!" 0903: Disastrous start for English hopeful Nick Dougherty, who double bogeys the first to drop back to two over and eight shots off the lead. 0858: And Ernie Els, like Calum Best on a Friday night bar crawl, is getting among the birdies early doors as well - snatching a shot back at the fifth to go level par. Northern Irish amateur Rory McIlroy, meanwhile, posts a par on the first. "It's a hive of activity in the BBC studio before going on air. Peter Alliss is checking talkback with the directors, Mark James and Ken Brown are studiously going through their notes and Gary Lineker is working through the running order for the opening. Barbecue legend (more of that later) Wayne Grady is reading the papers as he is not due on air till later." "My mate, in the throes of a break-up, says he's caught between domesticity and the call of the wild. I told him his problems are simple. I, on the other hand, want to be Rory McIlroy." 0851: Well it's not just the English that are suffering at the moment - Andres Romero's impressive start is interrupted as he takes a double bogey six at the ninth to go back to one under. 0847: Yep - Danny has done the English up like a right kipper. Paul Broadhurst is the latest to dig deep in the nasal passage and root out a beauty as he posts a bogey on the 10th to slip back to two under. Anders Hansen is doing just fine, though, as the Dane fires a birdie on the sixth to move alongside the pack of nine on two under. 0840: Ouch! Danny from London puts the mockers on it all as England's fine start to the day comes to a crashing halt with big hope Luke Donald taking a double bogey six at the third. The Englishman found the bunker with his drive, missed the green with his third and then two-putted to slip back to level par and six off the lead. "These English 'up' graphics make my screen look like the starting credits to Dad's Army. Keep them coming Luke and co!" 0832: While 14 birdies have already been sunk on this second day, Mark Hensby is feasting almost solely on a nine-year-old's choice dinner - the bogey. The Australian is four over for the day, 12 over overall, and is now joint last. Ouch. 0827: The eighth hole has proved a profitable one for many golfers already here this week, and Paul Broadhurst pulls alongside Anders Romero and five others with a birdie two, following a fabulous tee shot. 0821: A few of you have asked if I hit 'The Strip' last night and I must sadly inform you that, alas, I did not. Partly because I'm based in BBC towers down in London, with Matt Slater and Rob Hodgetts flying the online flag at Carnoustie. I did have a decent curry with a few mates, though, which eased the pain of being snubbed by my current squeeze. Don't you just 'love' it when they play all hard to get! "Andres Romero cant keep up this pace all day - like all other Alpha Romeos I know, he will break down on the way home!" "Blimey the weather is so much better in Carnoustie today. The sky is definitely a lighter shade of grey and I'm down to only three layers. The ice cream van opposite the 18th green is open for business already and I'm expecting it to double yesterday's sales of one Feast, a screwball and two Fab's." 0809: It's all about Andres Romero this morning - the Argentine moves into joint third with his fourth birdie of the day, this time on the sixth. Dane Anders Hansen is also enjoying himself, finding his second successive birdie on the fourth to move to two under. 0805: Luke Donald kicks off his second round with a par on the first and it's a steady start that. Playing partner Charles Howell III starts with a birdie and celebrates with a typically American high-five with father Charles Howell junior, or Charles Howell II if you will. How lazy are these people? Adding an 'I' onto your name does not constitute an effort if you ask me. "Morning. I wonder how the Welsh funky 'up' graphic looks? Hopefully a few Welsh boys can get a few birdies so we can see it!" "Class quote from the legend Peter Alliss on BBC2 last night when the omnipresent Hazel was waiting to interview Luke Donald... 'Lets go over to Hazel who's with Luke Donald... what a lovely pair'." 0755: Karen Stupples's assessment of the conditions appears to have been spot on - Paul Broadhurst joins the pack on two-under with a fine birdie on six, a bit of a turnaround for the Englishman, who bogeyed the hole on Thursday. Not only is Broady now the leading Englishman, it means I get to add a touch of colour to this commentary with the 'up' graphic - if you're looking on the website and not your mobile anyway. Jubbly. "I haven't been to sleep all night, do you know any cure for women crying and stuff?" Shaun - try ear plugs. Failing that, give her some flowers or chocolates - it never, ever fails. Ever. Sort of. 0741: Andres Romero is making the most of his early start, making birdie on four - his third of the day - to move to two under and a share of eighth spot. A bogey on two is the only blemish on his start so far. 0738: Erm, you are no longer 'all but guaranteed' to get your text posted now you all seem to have woken up. Please keep them coming, though - if only for my own amusement - and I shall try to publish the best and the worst. "Come on Garcia, Hope he holds it together and have a feeling he will this week. Although would be a great surprise if young McIlroy could win." "Whatever the problem, you will find the answer at the bottom of a beer glass." "Sitting at work, rain beating down, enjoy the weather up there...this coming ur way tomorrow." "Good luck to Ernie and the other South Africans in the field." "As an English teacher, i am happy to offer guidance on the correct use of their, there and they're! 0653 comment ended poorly!" 0732: Not the greatest of starts from Mark Hensby this morning - the Australian has slipped to 11 over par thanks to a double bogey and bogey in his first four holes. His chances of making the cut are slimmer than a catwalk model's ankles. 0727: I'll be honest, while Mr Qureshi's comments below may at first appear to be a load of psychobabble rubbish, not only is he more often than not described as "world renowned", he has just been taken on by Bolton Wanderers and is building a hot reputation in the sporting world. The fact that he stole my childhood sweetheart from me (seriously) should not affect your faith in his abilities... honest. "You have to deconstruct a thought before you construct it. You need to break down your fear of failure before building your zone to achieve." 0717: Top work from Paul Broadhurst at the third, the Englishman bouncing back well from a wayward tee shot to make birdie and that puts him in the pack of 14 on one-under. 0709: Home favourite Scot Sandy Lyle is rolling back the years at Carnoustie so far these past couple of days - and a birdie at the second this morning gives me the first opportunity to use our funky 'Scotland up' graphic - the excitement and buzz around the office if palpable. "Just a matter of time before that obnoxious brat Sergio chokes. It will be fun to watch his inevitable self-destruction over the weekend." 0653: First birdie of the day at Carnoustie - and no, I am not referring to the lovely yet omnipresent Hazel Irvine - as Andres Romero gets his second round off to the perfect start at the first. It takes him to within five shots of the lead... it's all really rather close at the top of the leaderboard as things stand. England's Ross Fisher follows suit and the indications are that birdies are there to be made this morning. 0646: And it's pars all round for the first group of the day - Paul Broadhurst, Mark Hensby and Jerry Kelly all taking a four at the first. "Scoring should be a lot easier today, the conditions could not be set better for golf." 0631: And it's a steady start to the day for Hensby, who fires the first tee shot of the day straight down the fairway. 0620: Morning people! Well well well, what a round from Sergio Garcia last night huh? The young Spaniard done good no? Whether he can maintain that superb form is a question for a new day... erm, this day in fact. He will get his second round under way at 0931, alongside playing partners Chad Campbell and Johan Edfors. First up at 0630 this morning will be England's Paul Broadhurst, who finished day one on even par, Australian Mark Hensby and Jerry Kelly of America. A host of other big names, such as Luke Donald, John Daly, Padraig Harrington, Ernie Els and surprise pise package Rory McIlroy all get started before 0831 today, so stay tuned here for all the action.